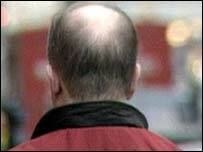 US scientists have found a good source of stem cells - hair follicles. The fact that hair grows quickly and is continually replenished makes it an attractive source to harvest the amount of stem cells needed for treatments. This has been a major stumbling block of stem cell research, as well as controversy surrounding the ethics of harvesting cells from embryos. The Proceedings of the National Academy of Sciences study shows nerve cells can be grown from hair follicle stem cells. Stem cells are immature cells that have the ability to become any kind of tissue in the body. Hair grows from follicles and new follicle cells are born from stem cells that exist in a small bulge on the side of the hair follicle. Researchers from the University of Pennsylvania have already suggested that these stem cells might be a way of treating baldness. Now Dr Yasuyuki Amoh and colleagues from the University of California, San Diego, have shown that the same stem cells could potentially be used to treat neurological conditions. They found that the follicle stem cells from the whiskers of mice expressed a substance called nestin, a known signal to tell cells to develop into neurons. They then tested whether the follicle cells could develop into mature nerve cells and found that they could when they were transplanted under the skin of the mice. The follicle stem cells were also able to grow into skin cells, smooth muscle cells and pigment-producing cells called melanocytes. "These results suggests that hair follicle stem cells may provide an accessible source of stem cells for therapeutic application," said the researchers. Dr Robin Lovell-Badge, head of the division of developmental genetics at the UK Medical Research Council's National Institute for Medical Research, said: "It's definitely a source of cells that needs to be explored. "We want to find the best source of cells possible." He said it would be important to compare the quality of hair follicle stem cells with stem cells derived from other sources. He said follicle stem cells carried the bonus of being relatively accessible.